Grinding is the process where diamond or abrasive tools are used to either even out or to create a smooth surface. 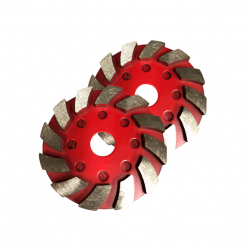 It is also used to expose aggregate, or to level out uneven joints in a surface. There are a number of ways to achieve this, however each project will dictate as to which process would be most ideal. For instance, you could possibly have a small surface, like a countertop or staircases, that you need to grind. For this application you would use an angle grinder combined with diamond cup grinders to grind the surface. Perhaps you have a small to medium sized floor that you need to level or prepare the surface for a coating. In this case you would you use a single head grinder with diamond grit consumables. Then there are those large scale projects or contracts where massive warehouses, parking lots or factories need grinding. The likes of these places have requirements for a surface to be levelled and sealed or coated to sustain heavy or high traffic. Here is where you would need to invest in high quality equipment such as a Blastrac Triple Head Planetary Grinder, Shot Blaster or Scarifier. 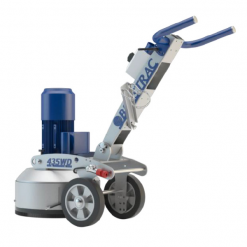 These machines would be used to level or prepare large surfaces for a coating or sealant. Surface preparation can apply to a number of different materials. These range from concrete, marble, granite, terrazzo to wood. We offer a range of tools that can be used on counter tops, floors, walls, tombstones, wood and concrete furniture. 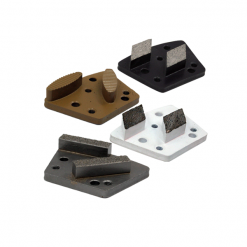 Among all the standard grinding tools, we also offer a specialised Polychystaline Diamond Cups (PCD). This is a specialised diamond impregnated system that are great for the removal of paint, epoxies and glues.